Fancy some stick? Slipstick, anyone? Wow. Sometimes the adored people at Symbolic Sound just keep on amazing me, time after time. In this video, SSC co-founder Carla Scaletti gives her Continuum a go. Why, oh why, did I ever sell mine? No, wait. It’s just my MacBook. 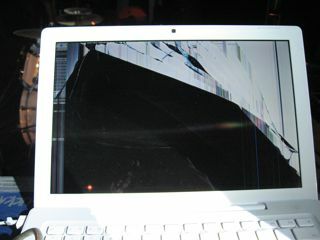 Or actually, not mine, it belongs to a friend of mine, but I’m sort of responsible for the damage. It was Midsummer Eve – which is a one huge party all over Finland (and Finland’s the place to be then, no matter whether it’s raining your ears off or scorching heat) and I was gigging. The roadies were taken a few beers too much and forgot to fix the stage clamps, which made the whole stage rig one big trampoline. If the guys in the front jumped up & down, the stage behaved like a flooding tsunami. Waves, literally. Then the rack it was placed on started to move. I noticed it crawl, but had my hands full, playing as I was. I watched silently MacBook fall down from the rack top, landing on its screen. Mysteriously, both the USB and FireWire cables were still connected and backing tracks running. Phew, I thought, it just scared us. The song ended and I had some seconds to move the laptop back to its place. I froze. The screen was gone bad. Actually, it was crushed. The main reason for the accident was, as it turned out later, not remembering to place the soft cushion-like piece of 3 cm thick polyurethane underneath our live MacBook. A mistake almost costing us our reputation as a live group (Ableton Live group, that is) and with some bad luck, the gig would have been over just after one song.